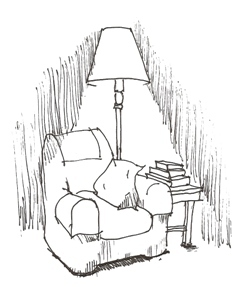 So a warm welcome to Niall Williams, my first guest in the dovegreyreader asks... armchair in the valley with lamp trained on countenance. After reading this I'd best make a declaration, I'm not professing to be an interviewer, others will do a far better job. No, I'm just plain nosey and I love talking to people, just think of me as the Mrs Merton of the blogworld. What a brick Niall is to travel here through all that snow, thank heavens the gritter lorries were out. We've thawed him out, the cushions are plumped and he's tucking into the scones and cream already. Rocky has taken a real shine to him so I do hope he's not allergic to cats. He's been an absolute saint to take time out of his busy writing schedule to do this for me and I'm very grateful. I've made no secret of my love of Niall's writing and I could have gone on all day but I'm limiting these to just six questions. I did however sneak in a final 7th one to Niall which I felt it my duty to ask and which he's still thinking about. Always a writer? If not how did you achieve it and who or what have been the greatest influences on your work? I was always a reader. As a boy I fell in love with Estella in 'Great Expectations' and thereafter I think sought in Dickens for such women, such strong emotion. When I went to college in Dublin to study English and French I was influenced by everyone. First DH Lawrence, then William Faulkner, Joyce, Yeats, Baudelaire. Whole years were spent inside books. And sometime then I began to write, probably to try and replicate that intensity of feeling I had as a reader. My first short story, 'Love' was published when I was nineteen in the national newspaper, The Irish Press, thereby giving me the first real prompt to take this most arduous path of equal parts doubt and rapture. Later influences are a whole throng. I admire many writers, but the novels of Gabriel Garcia Marquez when I first encountered them took my breath away. Can you describe an ideal writing day for you? I write for about three hours, always first thing in the morning, in the front room in Kiltumper overloking the big garden and the valley. I write out loud, saying the words as if I am the storyteller and the listener. Afternoons I try and get outside, to be in the garden, or go to the Atlantic which is not far. I allow myself to believe that this too is part of a writer's working. I don't have any exact schedule, or ever set myself word counts or such things. I write as I feel I can, just trying to figure out where the book is going as my hands touch the keys. When not writing I try to be outside. As above I think. Dickens of course. Shakespeare. The usual suspects. For a novel I have just finished on the last year in the life of the Apostle John, I returned to the Bible and found it startling and original and profound as a book. …and if you could choose where to put your “ island” where would it be and why? IN 2002 we took the children out of school and travelled around the world for a year while all the time I was writing 'Only Say The Word.' The two places that most stay with me are Patagonia for its sheer austere otherness. And NewZealand, a country of unparelleled beauty I think. The most striking almost classical book I have read recently was ' Gilead' by Marylynne Robinson. I know it is not to everyone's taste, but I read it in small savourings and really thought it perfect. One final question Niall...is it a long way from Clare to here? Sorry, sorry, just couldn't resist.